For the industrial township in Johannesburg, see Kya Sand. A community painted sign, reading "Kya Sands Formal Settlement, Please RDP"
Kya Sands is an informal settlement located in Region A of the City of Johannesburg. Kya Sands is bisected by the North Riding Stream (or Kya Sand Spruit according to some sources). 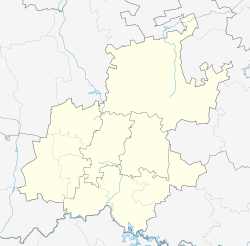 It is closely bordered by the Kya Sand industrial area to the west, the Bloubosrand residential suburb to the east, the Hoogland industrial area to the south (separated by the old Randburg landfill site) and mostly small holdings to the north. The settlement occupies both private and government-owned land, lying on 6 different farm and agricultural holdings. The privately owned sections of the settlement lie on the western side of the stream. City of Johannesburg owned land includes sections immediately adjacent to the stream and the property containing the old Randburg Landfill site (Houtkoppen 193-IQ ptn. 46). Portion 51 of the same farm (Houtkoppen I93-IQ), on which a large portion of the settlement lies, is owned by South African National Government and administered by the Gauteng Provincial Government. Kya Sands gets its name from the adjacent industrial area, Kya Sand. Other popular names for the settlement include Dumping and Kya Centre. The settlement is also referred to as Kya Sand, Phomolong and Kya Junction by some residents. Kya Sands is made up of a number of sections. The settlement is broken down firstly into Sections A to D. These are defined by government and are used in counting and numbering houses and toilets in the settlement. Other sections include Pipeline, the whole section of the settlement east of the river, and Madala Side, the northern part of Pipeline. While the exact year of the settlement's formation is disputed, indications are that it started in the early 1990s. Informal houses were initially set up in the area by subcontractors working at the adjacent (now closed) Randburg Landfill site and the Kya Sand and Hoogland industrial areas. 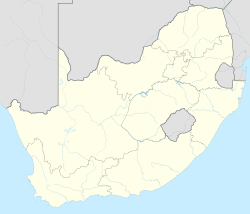 In the May 2008 xenophobic riots in South Africa, violence against foreign nationals was reported in Kya Sands, with police deployed to the area to try and curb attacks. As homes in the settlement are so close together, built from reused materials such as wood and plastic, and that most heating, lighting and cooking is done using open flames, fire poses a significant threat to the residents of Kya Sands. Local authorities, in the form of the Gauteng Provincial Government and the City of Johannesburg, have proposed a number of plans for long and short term intervention in Kya Sands, since 2007. While some short-term plans have been implemented, no long-term action (relocation or in-sutu upgrading) has been taken. On the contrary, the settlement has been extended since 2012, by government relocations to Kya Sands, from other nearby informal settlements. Between 2006 and 2008, a number of short term emergency interventions were implemented by the City of Johannesburg. These included the installation of basic services including stand pipes, ventilated pit latrines, and establishing a waste removal service through Pikitup. Between 2007 and 2008, some 150 households were moved by the City of Johannesburg from the western shore of the river, to section D of the settlement. In response to safety concerns, residents of Kya Sands had regularly called for a bridge to be built across the river. A bridge has now been constructed connecting Section C to Pipeline. Residents of Kya Sands periodically stage housing and service delivery protests, with the most recent protest taking place on 12 October 2015. ^ Professional Mobile Mapping (2009). "2009 Socio-Economic Survey, Johannesburg North, Kya Sands" (PDF). Retrieved 19 September 2013. ^ "Municipal elections results map". Independent Electoral Commission. Retrieved 30 May 2011. ^ "Councillors". DA. Retrieved 21 August 2017. ^ Koma, Kirsten. "City checks on flood damage". City of Johannesburg. Retrieved 11 April 2011. ^ a b c SAPA. "Kya Sands quiet after protest". SAPA. Retrieved 19 September 2013. ^ a b c d e f g h Weakley, Dylan (2013). Assessing Vulnerability and Resilience in Informal Settlements: The Case of Kya Sands, Johannesburg, South Africa (Academic Dissertation). Johannesburg: University of The Witwatersrand. ^ a b c d e f "Action to Provide Short and Long term interventions in Kya Sands Informal Settlement" (PDF). City of Johannesburg. Retrieved 19 September 2013. ^ S.K. Mokoena (2013). AN ANALYSIS OF THE XENOPHOBIC ATTACKS EXPERIENCED BY SOUTH AFRICA: THE CASE OF THE MPUMALANGA PROVINCE (PDF). Helsinki, Finland: GLOBAL BUSINESS AND TECHNOLOGY ASSOCIATION. pp. 843–848. ISBN 1-932917-09-8. Retrieved 25 September 2013. ^ "Wave of hate engulfs Jo'burg". Mail & Guardian. 19 May 2008. Retrieved 19 September 2013. ^ Luvhengo, Phathu (6 June 2017). "A man dies when fire ravages shacks in Kya Sand informal settlement | Randburg Sun". Randburg Sun. Retrieved 7 June 2017. ^ Luvhengo, Phathu (12 June 2017). "UPDATE: Police investigate fire accident in Kya Sand | Randburg Sun". Randburg Sun. Retrieved 12 June 2017. ^ Seemela, Masego. "14 shacks burn down in Joburg North". The Citizen. Retrieved 2016-11-21. ^ "Hundreds homeless after fire ravages Kya Sands". News 24. Retrieved 30 October 2018. ^ Watson, Amanda (11 August 2015). "Fire leaves dozens homeless in Kya Sands". The Citizen. Retrieved 11 August 2015. ^ Mdhluli, Nomsa. "Fire rages in Kya Sands informal settlement". ewn.co.za. Eyewitness News. Retrieved 10 October 2014. ^ Sapa. "Kya Sands fire leaves hundreds homeless". iol.co.za. iol News. Retrieved 10 October 2014. ^ Kubheka, Thando (27 January 2014). "200 homeless following shack fire". EWN. Retrieved 28 January 2014. ^ Gibbs, JeVanne. "Scorned Lover Blamed for Kya Sands Fire". The Citizen. Retrieved 15 October 2014. ^ "Police probe Kya Sands blaze". South African Government News Agency. 14 September 2010. Retrieved 15 October 2014. ^ "Faulty stoves blamed for fires". IOL. October 12, 2010. Retrieved 15 October 2014. ^ Nicolson, Greg (27 March 2012). "The broken vows and blocked roads of Kya Sands | Daily Maverick". www.dailymaverick.co.za. Retrieved 2016-09-26. ^ "Google Maps". Google Maps. Retrieved 2016-09-26. ^ "John Robbie revisits Kya Sand and Msawawa informal settlements". 702. Retrieved 2017-01-06. ^ Ngcobo, Ziyanda (12 October 2015). "POLICE MONITOR KYA SAND PROTEST". Eye Witness News. EWN. Retrieved 12 October 2015.